Electric Motion Pictures is back with a double feature! The afternoon starts off with their new film "Black Gold" followed by an encore of "The Black Donellys" . 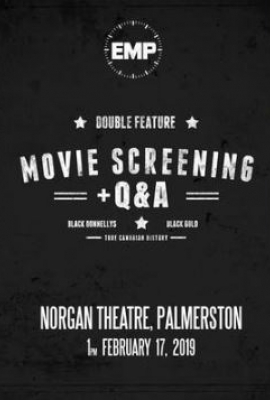 To finish off the afternoon members or the cast and crew will have a short Q&A. James Miller Williams is a struggling carriage maker. Ira Jackson is an escaped slave. Hugh Nixon Shaw is a fire and brimstone preacher without a church. Bootjack Mary is a middle aged prostitute. John Henry Fairbanks is a silver spoon land owner. They all have one thing in common, they smell opportunity when oil is discovered in the fields of Black Creek. While some strike it rich with gushers, others luck runs out and wells run dry. The gripping true story highlights the struggles and triumphs of the original Hard Oilers. The history of the infamous 1800s feud between the Donnelly family and the town people of Lucan, Ontario is finally being told on the big screen in this highly anticipated local production. After a land dispute went sour, a man lay dead and the Donnellys found themselves in the midst of a growing feud. On one side an Irish immigrant family known for their quick tempers and fighting prowess, on the other side an scorned mob dead set on revenge, and young love caught in the middle . The true story told at last, unbiased and unfettered. Tickets are $15 and must be purchased online through Eventbrite.